Saxophonist Elan Trotman, has quickly become one of jazz’s most thrilling and emotive performers as he continues to stand out and push boundaries as a composer, performer, teacher and recording artist. Trotman’s playing, though inspired by Grover Washington, Jr., Kirk Whalum and Najee, displays his own fresh ideas and distinctive tone. So much so that the New England Urban Music Awards, and The Barbados Music Awards both named him Jazz Artist of The Year on multiple occasions. 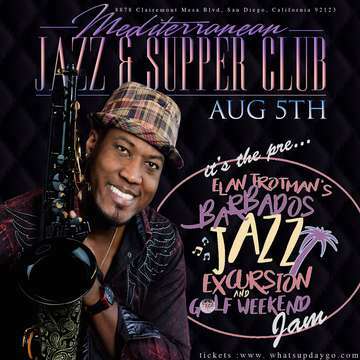 Trotman is also the Executive Producer and host of the Barbados Jazz Excursion, a jazz and golf weekend getaway which brings over 300 music lovers to the island every Columbus Day Weekend. Past performers include Jeff Lorber, Javier Colon, Gerald Veasley, Brian Simpson, Althea Rene, Marcus Anderson, Peter White and Jeffrey Osborne. Elan is also the founder of the Never Lose Your Drive Foundation – a Non-Profit which directly funds the Headstart Music Program. Headstart Music provides FREE weekly instrument instruction to students ages 7-11 on saxophone, trumpet, flute, clarinet and percussion. In 2016, over $6,000.00 was raised at the Jazz Excursion Weekend and Golf Tournament. All proceeds go towards tutor salaries, instrument maintenance and supplies for the program. Born and raised in Barbados, the native island of pop star Rihanna, and educated at the world-renowned Berklee College Of Music in Boston,Trotman approaches jazz in his own way. Blending Caribbean rhythms from his roots with skillful horn textures, his playing is full of surprises.